In Stock, Delivered By DHL Express. This machine use precise orbit devices import motor, which maintaining equipment vibration in the smallest value. Stainless steel, energy efficient heating appliances, automatic molding, automatic temperature control function. Large hopper design can hold 7L material. Simple operation and high efficiency. It have 3 size about the outlet. The biggest size: produce the 80~90mm donut (850 pcs /h). The middle size: produce the 60~70mm donut (950 pcs /h). The mini size: produce the 40~50mm donut (1100 pcs /h). 【PREMIUM QUALITY】(IN STOCK) Made of stainless steel 304, heavy duty and durable, and our machine uses precise orbit devices import motor, which maintaining equipment vibration in the smallest value. 【PREMIUM QUALITY】Made of stainless steel 304, heavy duty and durable, and our machine uses precise orbit devices import motor, which maintaining equipment vibration in the smallest value. 【3 SIZE AVAILABLE】Can adjust the 3 different thickness of the donut through adjusting the amount of the materials. Electrical controller to control the whole process. The biggest size: produce the 80~90mm donut (850 pcs /h): The middle size: produce the 60~70mm donut (950 pcs /h); The mini size: produce the 40~50mm donut (1100 pcs /h). 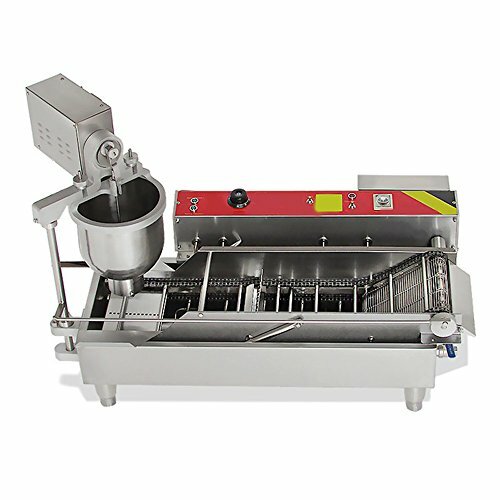 【EASY TO USE】The convenient doughnut mix can make delicious crisp golden doughnuts, we can also add peanut, or sesame, or fruit nut on the cookie surface when molding, automatic adding by machine.